Finally, temperatures in the 70’s this week. To me, this is jeans and t-shirts weather. My children, however, could not strip off their clothes fast enough after school today. 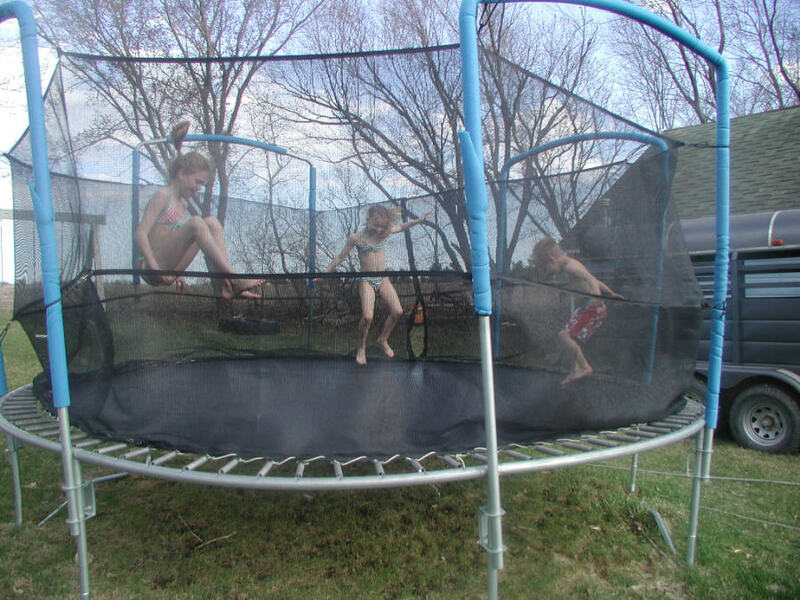 They jumped on the trampoline in their swimsuits, spraying ice cold water from the hose. I slept with the window open for the first time last night. Love hearing the frog songs coming from the creek at night. Makes for a good night’s sleep. Matt’s got a carpenter coming tomorrow to look at our corn crib. We want to re-do it into a farrowing/finishing building. We talked about putting up a hoophouse, but we just don’t have a place for one here. Renovating the corn crib would entail taking out the cribbing, pouring cement on three sides around the outside of the building, adding a lean-to on one or both long sides of the building, and running a water line out there. Buy some bred Chester White gilts, a new Large Black boar, and we’re in business. Also tomorrow Olivia and I are off bright and early to Iowa City. She had tubes put in her ears when she was 14 months old. They never helped her, she still had constant ear infections. (Whereas Rafe had them at the same age and hasn’t had an ear infection since.) At some point her body started rejecting the tubes, causing inflammation in the ear canal. She underwent surgery in August to remove them, and to plug the holes in her eardrums. One ear healed perfectly, but the other still shows a perforation in the ear drum and a lot of scar tissue in the ear canal. The AEA has been testing her hearing periodically at school, and we keep getting letters from them about the hearing loss she is experiencing. She saw her ENT doctor a few weeks ago, and his recommendation was to just wait to do anything until she is 10 or 12 years old. Best case, her ear would heal itself. More probable case, in his opinion, she would need surgery at either Iowa City or Rochester (Mayo Clinic) to replace her ear drum. The poor thing was in the room during this conversation. When we walked out of the clinic she solemnly asked, “Does this mean I’m going to be deaf?” I quickly assured her that’s not the case! On the one hand, I was glad he didn’t want to do surgery right away again. A couple of months ago that’s what he was talking about doing. On the other hand, I don’t want to wait 2 to 4 years to do anything. Our family physician agreed and recommended we go to either Iowa City or Rochester for a second opinion. Rochester is only an hour away, as opposed to 3 hours to Iowa City, but our doctor favors Iowa City and I’ve heard similar opinions from others that have doctored there. So I’m anxious to hear what they have to say tomorrow!